5793 labyrinths found. Showing 2801-2820. Sorted by country, state, city, then zip/postal code. Located on the Creekside Church campus north of the Creekside facility. It is west of the Prayer Garden. N 41� 36.999'° Lat. ; W 85� 55.136'° Long. In front of the Liberal Arts Building facing the quadrangle on campus. 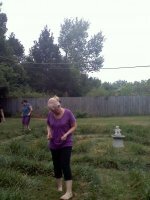 Canvas labyrinth available during inclement weather and for facilitated walks. Contact Fr. Tom Hansen at 260-423-1693 for availability. 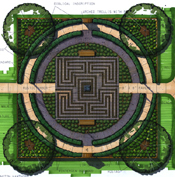 Our outdoor labyrinth is now available. Please enter from the corner of Berry and Broadway as we work on landscaping this property. 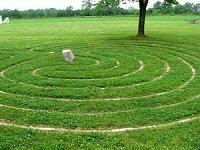 Please enjoy our labyrinth located near the southeast corner of Resurrection Lutheran Park. 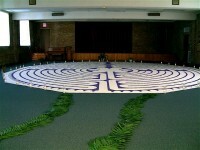 We hope you will take the time to walk the labyrinth, connect with God, and find some peace. The Park is a work in progress, so we are always updating and adding features. Welcome and Enjoy! The labyrinth is behind the parking lot of Richard's Brick Oven Pizza restaurant. Cretan design. It is located in a woods under walnut tree canopy. Renewal Labyrinth. It is a based on a replica of the Chartres Cathedral labyrinth design, with only eight concentric circles instead of 11 in order to fit the smaller space. Walking the labyrinth on the grounds of Purdue University Calumet for the Napoleon Hill World Learning Center Open House May 5, 2008. May 4 - 7, 2009 for the Napoleon Hill World Learning Center Open House 2009. Chartres replica, except no rosette at the center, instead there is a large tree in the center, and two benches. The labryinth is located in the lot south of 947 N Kealing Ave in the Rivoli Park Neighborhood in Indinaapolis, IN. Please park in the back of the lot off the alley, rather than on N. Kealing Ave if possible. The nearest major cross street is E 10th Street and N Sherman Dr. Please do record your visit in the guest book in the light green box near the entrance of the labyrinth. The labyrinth is open for public use any day, dawn to dusk. Please do record your visit in the guest book found in the light green box near the entrance of the labyrinth. The lot is owned by a resident in the neighborhood, so in that sense it is private, however the labyrinth is open to the public to use any day, dawn to dusk. It is situated on an open lot in the middle of an urban neighborhood. Please park in the back of the lot off the alley. Triune Focus design created by John E Ridder of Paxworks: the Labyrinth Shop. 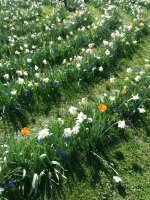 Blooms in Spring: planted with 6500 bulbs of crocuses, daffodils, grape hyacinths and tulips. Find the labyrinth blooming in Spring just north of the playground in the Martin Luther King Jr. Memorial Park. Planted to honor of Dr. King and in remembrance of the 50th anniversary of his assassination. Labyrinth is not set up at this site; this is the contact information for organization that owns portable labyrinth. 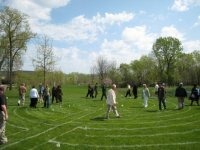 Canvas labyrinth is available for use by Disciples or UCC congregations desiring to sponsor a labyrinth workshop and/or walk. Labyrinth must be accompanied by DHM facilitator; it is not loaned out without accompanying staff. Northeast side of Indianapolis, 48th and Allisonville Rd. Must call for appointment or send email to be added to group events/walks.